Whatsapp ko Yahoo ke former employees Brian Acton aur Jan Koum ne 2009 me banaya tha. Jab Facebook ne Whatsapp ko acquire kiya gaya, tab gift ke rup me free voice & video call feature add kiya. Isse ye hua ki jaha people video calling ke liye Skype ko money chukate the, ab Whatsapp se free calling kar sakte hai. Whatsapp me AD na hona, ye platform ko puri tarah se user friendly banata hai. Jisse user ke experience thoda sa bhi bad impact nahi padta hai. Shuruat me Whataspp 1 dollor per year charge karta tha, par ab use bhi band kar diya. Matabal ab user freely Whatsapp ko use kar sakte hai. Whatsapp encrypted connection use karti hai. Jiske karana koi third party aapke data ko nahi dekh sakti hai. Aapki privacy hide bani rahegi. Whatsapp me dhere emoji hai, jiske use se apne emotion apne friends ko show kar sakte hai. Jo chatting ko smooth and enjoyable banata hai. Facebook Group ki tarah Whatsapp me bhi group bana sakte hai. Jisse aap ek sath apne message ko sabhi friends tak pahuncha sakte hai. Isi ke chalte people apne PC me bhi Whatsapp ko enjoy karna chahte hai. Jabki ise specially smartphones ke liye banaya gaya hai. Aage me aapko whatsapp ko pc me chalane ke do method batayunga, jo behad simple hai. Is tarike se pc me whatsapp chalana sabse easy hai. Iske liye aapko keval Smartphone, PC, PC Browser ki jarurat hogi. 1.Smartphone me Whatsapp open kare. 2.Top right side ke ant me three dotted line milega. Us par click kare. 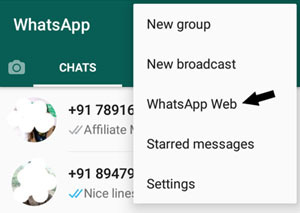 3.Third option WhatsApp Web par click kare. 4.Ab PC/Laptop ke Browser me WhatsApp Web ko open kare. 5.Website open hone ke bad ek QR code dikhega, use smartphone se Scan kare. Ab kamal dekhiya, aapka Whatsapp account pc me open ho jayega. Yah tarika thoda sa long hai. But isme aapko smartphone ki jarurat nahi padegi. 1.PC me Bluestack & Whatsapp APK file download kare. 3.Bluestack ke Install App option se Whatsapp APK file ko install kare. Ab normally Whatsapp par account create kare aur chalaye. Kisi bhi android app ko laptop/ pc me directly nahi chalaya ja sakta hai. Iske Anroid Emulator ki jarurat padti hai. Isi tarah Whatsapp bhi ek anroid app hai, jiski window version nahi hai. Isliye aap third software ki help se easily whastapp ko pc me enjoy kar sakte hai. Vaise dhyan rakhe, anroid emulator ka use us laptop me kare, jiski RAM capacity achchi ho, because ye RAM highly use karte hai. Vaise main aapko Bluestack ke liye recommend karta hu, jo sabse best anroid emulator hai.